The easiest way to pay off debt is by finding the best side hustles that fit your schedule. There are a billion great side hustles out there, everything from proofreading to delivering pizzas. Some involve learning a new skillset, while many others have costly start-up fees to get going. The key to finding side hustles that work are to focus on ones that fit into your life. If you have a 9 to 5, or do shift work, you’re most likely to find success with finding somewhat unusual ways to make money. Finding an MLM isn’t likely to work, seeing as how their success rates are stastically dismal at best. 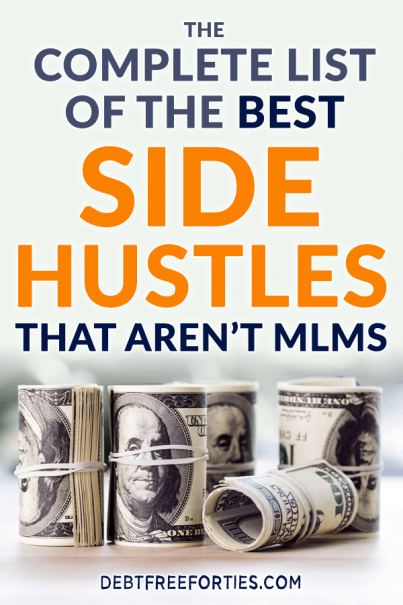 MLMs (multi-level marketing) are side hustle jobs that are dependent upon your commission from sales, but also on getting others to sign up underneath you, so you’re earning a bit of their profits as well. They usually involve some sort of in-home or online party where a friend hosts it to make money towards their purchases. It usually involves products from leggings to face creams to kitchen products to kids books to food. You know what I’m talking about, right? There’s one for just about any type of product you can imagine. While I’m not personally against MLMs (as I’ve said before), they work for such a small percentage of people. Why? Because not everyone’s built to be a salesperson. If you don’t have the right skillset or personality (or an insanely HUGE friend/family group to sell to), it’s almost impossible to make back the start-up money that you invested. Not only have you lost our on your time and energy, but you’ve lost out on even more money than if you’d done nothing at all. On top of that, we’ve recently run into a rash of bizarre and ridiculous news stories in which women (typically) are being pushed into buying more product to sell, even when sales are down. When they try to step away from the business, they end up stuck with a ton of merchandise they can’t offload and no way to recoup that cost. While I believe that you have to invest money to make money, starting the best side hustle for you shouldn’t cost an arm and a leg. It also shouldn’t be a steep learning curve to getting yourself up to snuff in order to make money. When choosing the best side hustle to make money, you need to think about your return on investment. If you’re looking for a part time businesses to supplement your income, and just need to make quick money, remember to keep things simple. There are plenty of ways to make money with little to no money to get started. I’ve gathered a list of easy and low cost side hustles that aren’t MLMs to get you started quickly on your path to debt repayment! I love finding online jobs for extra income – they tend to be easier side hustles and can be done while watching TV in the evenings. There are a ton of side jobs from home out there, but unfortunately a lot of them can be scams. Be careful with anything that sounds too good to be true! Do surveys on Swagbucks, Survey Junkie, Springboard America, etc. Driving or delivery side hustles are a great way to get out of the house and make some money. It’s not all about delivering pizzas, as Dave Ramsey would suggest. Thanks to technology, there are so many more options to get paid to drive now. 10 years ago, your options were to deliver pizzas or find seasonal work with the post office, UPS or FedEx. Look around for your position at another company – get paid more for the same work! Remember, you already have the skillset, so your learning curve would be minimal as well as your financial investment. Going with a job that you already currently do – but in a different capacity – is one of the best side jobs for extra money out there. Active income is money that you earn by doing an active job, such as your 9 – 5 office job. Passive income is income that’s created by investing either time or money into an income stream, and then reaping the benefits further down the line, once all of your work is done. Earn referral fees for products you use, such as Ibotta or Ebates. If you’re interested in learning more about other passive income ideas, check out The Best Passive Income Ideas to Boost Your Income. How Do You Figure Out the Best Side Hustle? The best advice I can give is to find side hustles that match your skillset. By picking jobs that you already know how to do, you’ll feel more confident when applying for them, and will be able to have a larger return on your investment by shortening your start-up costs and time. Making money on the side doesn’t have to be hard or time consuming. It’s about finding different hustles that fit your needs. When you figure out what you need, and take a look, you’ll find tons of great ways to make extra money. Speeding up the debt repayment process doesn’t have to be difficult, costly or overly time consuming. What it really takes is figuring out your “why” and putting yourself out there. If you’re willing to work harder and smarter, you’ll find yourself debt free in no time! Have you figured out the best side hustle for you that fits with your schedule and family? Or do you have more to add? Post them in the comments, I’d love to hear them! These are all great ideas except for do nails and cut hair. You need licensing to do both, legally. ? Jessica, excellent point, I did not realize that. Thanks for letting me know! What kind of certification is required to become a coach?? Reviewing resumes is a great one. I had a friend do that for me, as it was her side hustle related to her 9 to 5. She offered great insight.. I used to be a dog walker and absolutely loved it! I miss it so much. Some great ideas here, it’s so important to diversify your income. I’ve learned quickly since going self employed this year, you need several income streams because one can suddenly be gone overnight! I love that there are no MLM in here too, I’m really not convinced! Some really good ideas here… I already do dog sitting on the side which is a lot of fun! All excellent points, here! However, the priceless one, MLM’s are built for everyone to be a salesperson and everyone isn’t! Some brilliant ideas there Tana. Video game tester would be a dream for me. I work mainly weekends and could definitely find some time to earn a bit on the side. Wow! That’s an impressive list. Thanks for sharing! this is such an amazing list! i’ve been trying to think of some side hustles to do and i’ve always thought about doing soap or candles on etsy. Great list! I have another to add that’s almost as easy to do as going for a daily walk. Do you enjoy being outdoors? Then consider providing a “green” service. Clean up litter outside commercial properties in the early morning hours. The work is done on foot using simple hand tools. I started this business as a side gig in 1981 and grew it into a profitable full-time business that I still operate. I share my experience in my book, Cleanlots, as well as offer free support. Brian, very cool – congrats on the book! That’s amazing that you grew it into a full-time income, impressive! This is an AWESOME list! Can’t wait to try some of these. I am brand new on my debt journey and I think some of these will be super useful. Thanks!